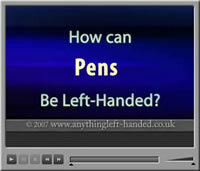 If you are looking for the perfect gift for a left-hander, we can offer you inspiration. From a recent poll of left-handers we have compiled a list of the Top 10 most popular gifts requested by lefties. Not surprisingly, a decent pen that solves the problems of writing left-handed without smudging tops the list. With their hand following behind the pen as they write and draw, it’s no wonder left-handers’ masterpieces usually end up a smudged mess! The latest innovation in pens is instant drying ink that dries immediately it touches the page – a huge hit with left-handers of all ages. With the blades reversed as well as the handles, truly left-handed scissors can be hard to find, but heaven to cut with as they follow the cutting line without tearing, and without squeezing the handles together so hard you bruise your thumb knuckle. Manicure, kitchen and desk scissors are the most popular. Very popular with children, who love the idea of a pencil case full of tools that actually work. 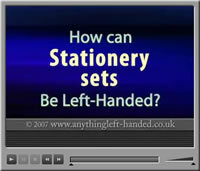 A gift set of stationery items that includes sharpeners that rotate the correct way, pens that don’t scratch or smudge, rulers they can read right to left and notepads bound on the right, make a perfect gift for little lefties. Executives chose these soft leather folders, that look and feel great as well as arranging all their papers and notes correctly for left-hand use. Writing pad and pen holders are on the left side of the folder, whilst papers and business card slots are the correct way up so they don’t fall out all over the floor. 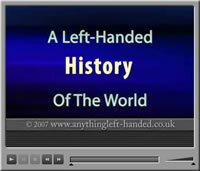 With all the superstitions and prejudice left-handedness has faced over the years, it makes a refreshing change to read about the fantastic achievements of left-handers through history, so a new book A Left-Handed History of the Worldâ€ by Ed Wright has proved very popular. From Pharaoh Ramses the Great to Microsoft’s Bill Gates, this book profiles influential left-handers in history, and discusses how their leftie traits contributed to their greatness. 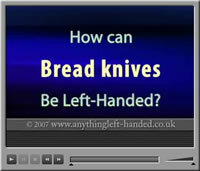 Lefties are notoriously bad at cutting bread, but only because they are given the wrong tools! A left-handed bread knife has the serrations on the right of the blade so they counteracts the natural twisting motion of the left hand to give straight slices. 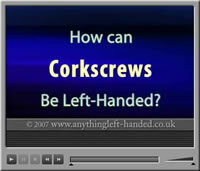 If a left-hander looks awkward removing a cork, or you see them holding the corkscrew still and rotating the bottle, it is because they need a proper left-handed corkscrew that turns anti-clockwise. 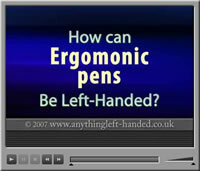 Usually “Ergonomic” means “designed for easy use in the RIGHT hand”! 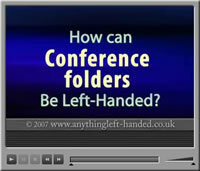 But some manufacturers are starting to make version of their ergonomic products for left-handers as well or to design them so they are equally beneficial in either hand. 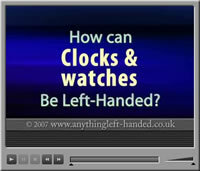 Moving anti-clockwise is a more natural direction for left-handers and this, together with their enhanced right-brain ability to manipulate 3D images in their heads, makes them much better at reading anticlockwise watch and clock faces that tens to confuse right-handers. Traditional playing cards have the numbers top right and bottom left so if you fan them in your right hand (so you can pick and play left-handed) you cannot see what you have got! The simple answer is a set of cards that are marked in all four corners. I love this list, and the fact that the videos are all entitled “how can …….. be left-handed?” – a question I get asked a lot by sceptical righties. 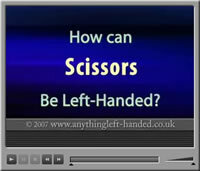 I had a boss once who was always giving me flyers to cut up and laughing when I struggled, I bought myself some left-handed scissors and got the inevitable “don’t be silly, how can they be left-handed?” so I swapped them for his “normal” ones when he wasn’t looking and then asked if he’d mind helping me. Oh I did enjoy myself while he became more and more frustrated trying to cut a straight line and not having a clue why he couldn’t! I have found this a lot, that righties just don’t get it when you try to explain e.g. about the serrations being on the wrong side of the knife, unless you actually put the knife/whatever in their hand and get them to try it out. Anyway I love being a leftie!